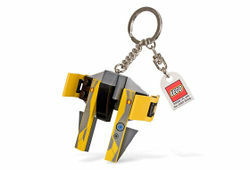 852247 Jedi Starfighter Bag Charm is a Star Wars Key Chain of Anakin Skywalker's Yellow Jedi Starfighter released in 2008. A key chain is attached to one brick. Facts about "852247 Jedi Starfighter Bag Charm"